The long dusters. The dirty towns. Extreme close-ups. Lengthy stares. Dubbed dialogue. And, of course, the Morricone music. I love a good Spaghetti Western! Here are my top 10 films in this popular genre from the 1960s and 1970s. 1. Once Upon a Time in the West - I never cared for the slang term "horse opera," but "operatic" definitely describes what I consider to be Sergio Leone's masterpiece. This sprawling saga of a dying West boasts interlocking stories, some marvelous set pieces, a terrific Ennio Morricone score (with unique themes for each of the four leads), and memorable characters (which both support and defy Western film stereotypes). My favorite parts are the opening (it's a long wait but I love the payoff) and the almost over-the-top showdown between Charles Bronson's mysterious Harmonica and Henry Fonda's vile villain Frank. 2. For a Few Dollars More - My favorite of the Leone-Eastwood collaborations is almost a rehearsal for Once Upon a Time in the West. In the latter film, Charles Bronson wears a harmonica around his neck--and we learn why in the flashblack that explains his need for revenge against Henry Fonda's character. In For a Few Dollars More, Lee Van Cleef carries a watch that serves the same purpose. Eastwood's sarcastic humor and Van Cleef's steely resolve make them a great pair. blue eyes in this photo. 3. Trinity Is Still My Name - The sequel to They Call Me Trinity is funnier than the original, with Terence Hill and Bud Spencer back as the West's most unlikely--and filthiest--brothers. Hill became a big European star, but his success never translated in the U.S. (though he tried in movies like March or Die with Gene Hackman). 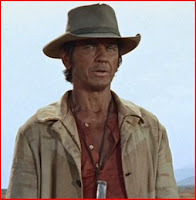 His oddball humor works very well in the Trinity Westerns, especially playing against the gruff, burly Spencer. Hill (real name Mario Girotti) and Spencer (Carlo Pedersoli) appeared as a team in numerous films, including other Spaghetti Westerns and contemporary action comedies. 4. The Five Man Army - I'll admit upfront that I'm a sucker for movies where someone assembles a team to accomplish a mission (e.g. The Adventures of Robin Hood, TheMagnificent Seven, The Dirty Dozen). So, here we have Peter Graves--who knows something about impossible missions--assembling a team of specialists to rob a moving train. Horror film maestro Dario Argento co-wrote it (he and Bertolucci also worked on Once Upon a Time) and Morricone contributed yet another memorable score. Plus, where else can you find James Daly and Bud Spencer in the same film? 5. Red Sun - OK, it may not technically be a Spaghetti Western, since it was made in Spain with an international cast. Also, I confess there's not much of a plot (a valuable Japanese sword is stolen and everyone goes after it). But Charles Bronson and Tohiro Mifune make a fine odd couple, Alain Delon does his patented good/bad guy, and Ursula Andress...well, she's just there. Still, it's surprisingly entertaining and holds up well. 7. Django - The plot recalls A Fistful of Dollars (see #10), with a mysterious stranger coming between two warring factions in a small town--but the similarities end there. 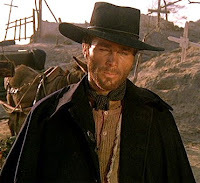 Religious images abound, starting with the film's protagonist dragging a coffin through the mud and ending with Django, both hands crushed, trying to balance his pistol on a cross as he awaits a graveyard showdown with a band of bad guys. It's an uneven, violent picture (banned in some countries), but the climax may be surpassed only by Once Upon a Time among Spaghetti Westerns. 8. My Name is Nobody - Another unlikely Leone teaming: this time between Henry Fonda as a veteran gunslinger and Terrence Hill as an up-and-coming one. (Techincally, Leone did not make this film, but his influence is all over it and some sources claim he directed some scenes). More an essay on celebrity than a Western, it benefits from an offbeat sense of humor. 9. Sabata - Van Cleef made other Spaghetti Westerns (including Death Rides a Horse, which I haven't seen), but this one probably confirmed him as Eastwood's successor as a solo star. It also helped popularize the "trick weaponry" used in other Westerns (e.g., Sabata carries a pistol that fires from the handle). 10. A Fistful of Dollars - Obviously, it's my least favorite of the Leon-Eastwood films, even though it was inspired by Kurosawa's Yojimbo. Still, it's historically significant and the final shootout is a classic. One of my favorites was God's Gun with Lee Van Cleef and Leif Garrett. It's surely on my list of top ten. That's quite a twosome. Sounds interesting; I'd like to see it. A fine list, Rick. No arguments with any of your choices. A few years ago there was an online survey asking which film you would like to released on DVD. I put down "Red Sun." Sigh. Still waiting. Kevin, I just saw DJANGO recently and was surprised. I wish that Tarantino was doing more of a remake with his DJANGO UNCHAINED, but it sounds very different. As for subtitles, after five minutes, I always forget I'm reading them! Rick, I prefer my spaghetti on a plate, served with garlic bread. But I really do think "Once Upon a Time in the West" is a classic film. Fun post! Toto, the TRINITY boys have a funny restaurant scene in one of their movies...not sure if they actually order spaghetti, though (that would be funny!). It took me a few viewings to truly appreciate ONCE UPON A TIME IN THE WEST, but now it's a favorite film (and I mean all genres). Rick, this is a nice post! Some of them I haven't seen so I put them on my "to watch" list. The one which is my favorite of the ones I have seen is Red Sun. I even wrote an article on your blog about it. It is one of my favorite westerns and I love the music. Enjoyed read this. Aki, if you click on the RED SUN title in my list above, it will link to your excellent review. It's a very entertaining flick and, like many of these movies, has a fine score. (I forgot to mention the DJANGO song...which is very different for a Spaghetti Western). The Western genre isn't my favorite, but I'm happy that I've seen nearly every film on your list. I concur with all of your choices, but I'm especially pleased with the inclusion of FIVE MAN ARMY and RED SUN because those are two often overlooked films. 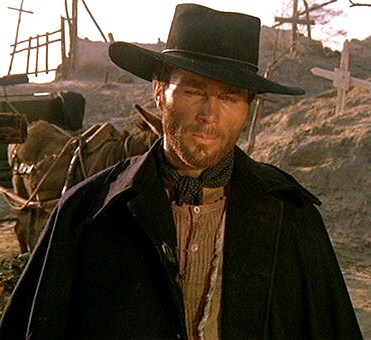 And I completely agree that FOR A FEW DOLLARS MORE is the best of the Man With No Name Trilogy. And Terence Hill and Bud Spencer may be the most underrated duo of all time. I haven't seen SABATA, and now, of course, your list has piqued my interest. A superb spaghetti ten! Sark, SABATA doesn't rate with the others you mentioned, but is a fine example of one of Lee's solo efforts. Yes, THE FIVE MAN ARMY is sadly overlooked. I was pleased that TCM showed a letterboxed version of it a couple of years ago. Gotta go with TGTBTU as my favorite spaghetti. I've never thought the first 2 Eastwood/Leone's were that great for some reason. And I love the the main characters in Once Upon a Time in the West and their respective theme music. As for Claudia Cardinale..., she coulda tamed the entire West. I just rewatched FOR A FEW DOLLARS MORE and it holds up well for me. Loved how Leone had the watch music overlap at the climax as we learn the connection between Colonel Mortimer and El Indio. Really enjoyable post, Rick, and also an excellent intro to the genre. I don't know much about this particular genre, but your selections whet my appetite (for more than spaghetti!). Thanks for the info, GOM. Great line-up, but no Terence Hill? Great post! I love me a good spaghetti western, and I've seen and loved many of the ones you listed (with the exception of The Five Man Army, which I have been trying to track down in a decent DVD copy). You mentioned you haven't seen Death Rides a Horse...it is indeed another top-notch western with Lee Van Cleef and John Phillip Law. I also recommend Companeros and Keoma, both with Franco Nero. There is a nice Japanese blu-ray of Red Sun that I recommend for those looking for a good copy -- and being Region A, it'll play just fine on U.S. machines. Just watched DEATH RIDES A HORSE and was impressed. One of Lee Van Cleef's best and I really liked the unexpected turns in this revenge tale (e.g., the trap door!). Not my favorite Morricone score, though I guess Quentin Tarantino liked it. I've seen a number of the films in your top 10 and I agree with them being selected. Have you ever seen The Good, the Bad, and the Weird (2008)? It's a modern-day spaghetti western out of Korea. I think you would like it.